If you’re a fan of the tart, tangy flavor of rhubarb, then these preserving tips are for you. Once safely preserved, you’ll be able to add that one-of-a-kind taste to delicious pie, tart, and muffin recipes any time of year. You may even like to experiment with sauces or spreads. For a baked-good, sauce, and spread friendly product, try either canning or freezing your rhubarb according to the directions below. If you are new to canning, or could use a refresher of the basics, then please read Using Boiling Water Canners and Principles of Home Canning before beginning. Select young, colorful stalks and trim off the leaves. Wash and cut the stalks into 1/2 to 1 inch pieces. You’ll need to know how much rhubarb you have in order to figure out how much sugar to add, so measure your sliced rhubarb and then place in a saucepan. For each quart (4 cups) of rhubarb, add ½ cup sugar to a saucepan. Wait for juice to appear, and then heat gently to boiling. Immediately pack hot rhubarb mixture into hot jars, leaving 1/2 inch headspace. Release air bubbles, wipe jar rims, adjust lids, and process in a boiling water bath for 15 minutes. If you are using a pressure canning, please refer to the time tables at http://nchfp.uga.edu/how/can_02/rhubarb_stewed.html. 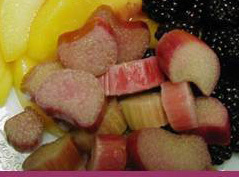 Rhubarb can be frozen with or without sugar syrup. Either way, begin by selecting tender stalks with few fibers. Wash and cut into lengths that fit your freezer packaging (air-tight, moisture proof plastic or glass containers). To help rhubarb retain color and flavor, heat it in boiling water for 1 minute and cool promptly in cold water. 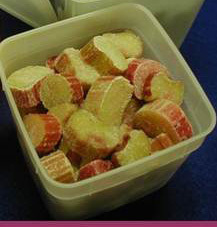 For a dry pack, tightly pack the raw or preheated rhubarb into containers, leaving ½ inch headspace. Seal and freeze. 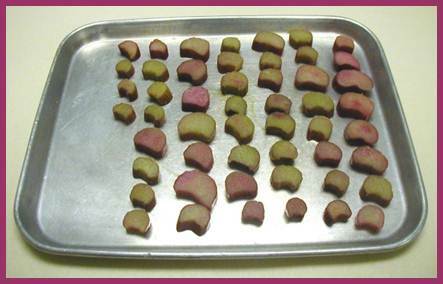 You could also tray freeze the slices in a single layer on a baking sheet just until hardened, then pack dry into your containers. Tray freezing is the best way to have loose slices easily removed from the package. For a syrup pack, pre-make a 40% syrup: mix a proportion of 2 ¾ cups sugar to 4 cups lukewarm water and stir until the solution is clear. Chill syrup. Tightly pack the raw or preheated rhubarb into containers, and cover with cold 40% syrup. The amount of headspace needed depends on the size of the container and if its top is narrow or wide. See the table at http://nchfp.uga.edu/how/freeze/headspace.html to determine how much headspace you need. This entry was posted in Canning, Freezing, Seasonal Food Tips and tagged baked goods, rhubarb, rhubarb pie, sauces, spreads on June 7, 2013 by nchfp.